Science Fiction and Fantasy fandom (or fendom for those in the know) lost two greats this summer very close together when SFWA Grand Master’s Ray Bradbury and Harry Harrison passed away within a few weeks of each other. Although for many outside fandom, Bradbury was the better known, amongst fans, Harrison, who died at his home in Brighton, England, on August 15, 2012, was well known for his character the Stainless Steel Rat and for his novel Make Room! Make Room!. The latter having been used as the rough basis for the motion picture Soylent Green. Harrison started in the field as an illustrator, working with EC Comics on the series Weird Fantasy and Weird Science. 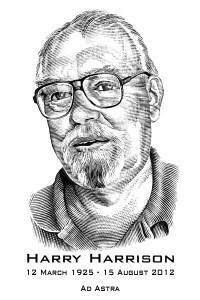 He edited magazines and published fiction under house names like Philip St. John, Wade Kaempfert, Felix Boyd, Leslier Charteris and Hank Dempsey, and wrote for syndicated comic strips including the “Rick Random” and Flash Gordon series. His stories on serious themes include Make Room! Make Room!, a novel about overpopulation and consumption of resources, on which the 1973 film Soylent Green was partially based, although significant plot and theme changes occurred. He also collaborated with fellow Grand Master Brian Aldiss on a series of anthologies and, together, they helped to raise the standards of criticism in the field. Their efforts included The Year’s Best Science Fiction anthology series and three volumes of Decade collections covering the 1940s, 1950s and 1960s. He was awarded the Damon Knight Memorial Grand Master Award in 2009. Harrison’s official website reported his death on August 15, 2012.